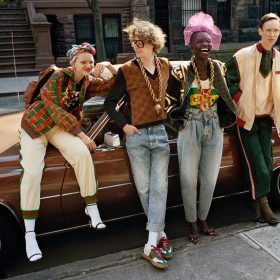 The collaboration of the year, Gucci-Dapper Dan collection is finally here and exclusive to Gucci.com. The Italian fashion house has joined forces with the legendary Dapper Dan with a thrilling collection paying homage to his Harlem heritage. You can expect the signature GG logo, motifs, large emblematic lettering, applique and Swarovski encrusted details, harkening back to the famous Dapper Dan archives of the 80’s and 90’s. This is the Dapper Dan aesthetic, Guccified! The Gucci love of typography is not lost in this collaboration, with the Latin phrase “E PLURIBUS UNUM” (“Out of many, one”) engraved and embroidered on jewellery and clothing. Out of many be the first to shop this must-have and inspirational collection, and if you missed out on the exclusive line, check out our top picks from Gucci with a similar vibe.